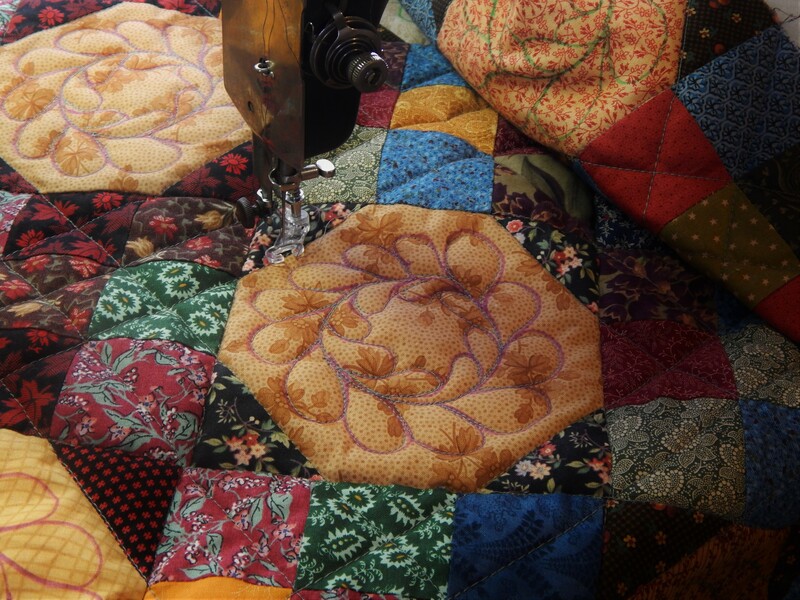 Yesterday I posted about the quilting that I am doing on the vintage/antique log cabin quilt. 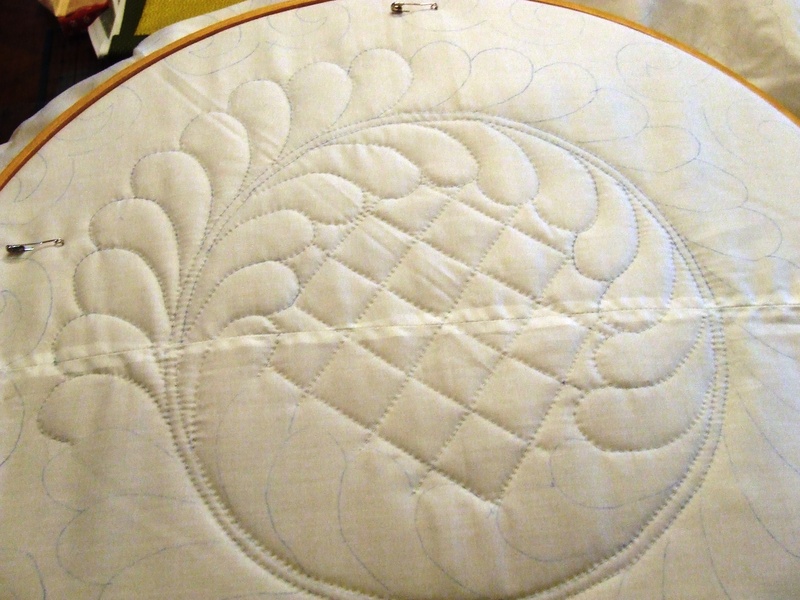 While I was doing that quilting I started thinking again about making a whole cloth quilt. I have been wanting to tackle one for a long time and what has been the barrier is that I just can’t stand marking! I am just not accurate at all. Almost all of my sewing is done without a pattern , seam allowances are done by eye, I use my arm for a yard stick, I use kitchen bowls for templates. Yesterday the light went on, I can do a whole cloth quilt without the traditional perfectly symmetrical and geometric marking. I grabbed a hunk of muslin off the pile and a scrap piece of wool batting and made a little quilt sandwich. With a wash away marker I drew a 9″ x 12″ rectangle (AAQI quilts need to be that size) and a quick outline of a few leaves and a stem. I should have put something in the picture to show scale but to give you an idea this leaf is 2″ wide. I need to bind this little quilt and send if off to AAQI. I think it is a great way to try out something new….make a little sample and make that into a little quilt for a good cause. This entry was posted in Quilts and tagged AAQI, Alzheimer's art quilt initiative, hand quilting, Quilting, Quilts, vintage quilt top, whole cloth quilt. 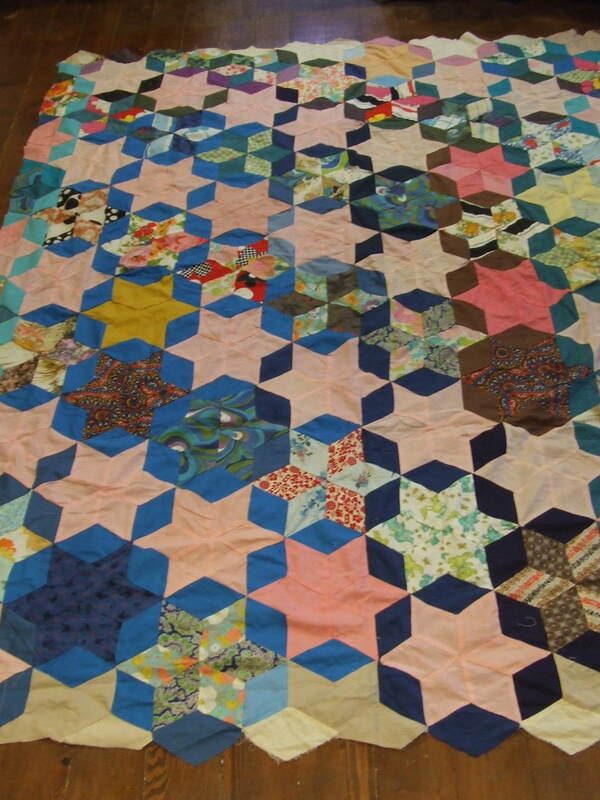 the big quilt does look like it is from the 70’s and the little quilt is so neat – I have not done any thing little like that – what is the link for where you are sending them, I would like to read up on it. That is a great way to venture into a technique that holds some reluctance or resistence to attempt. A beautiful little quilt! Are you tempted to tackle a full size one now, asap? I am already thinking about what fabric to buy! That AAQI is a stunner! 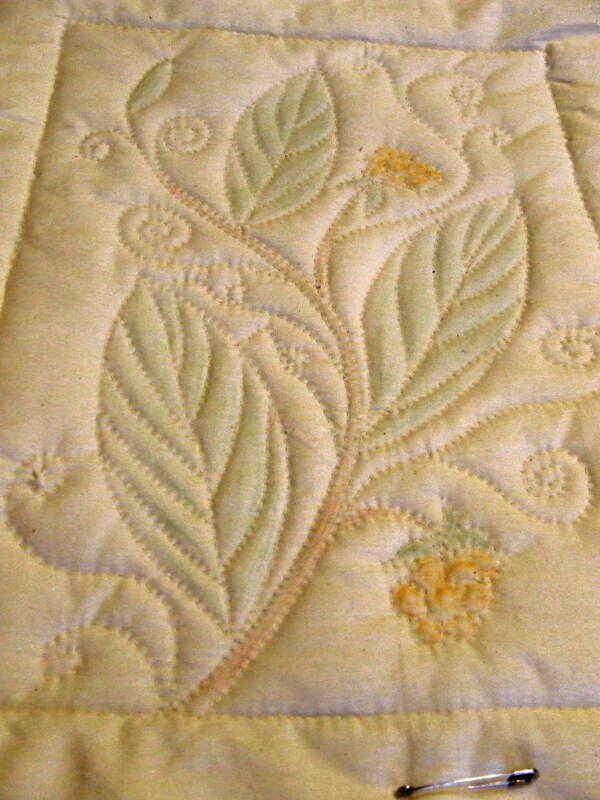 Your quilting is so beautiful, Tim. I love that you improvise your patterns from ‘whatever’ is around! You rock! And your new stars quilt is fantastic! Fun colors and fabrics……a wild, but beautiful look! Oh, my goodness, that little one is a stunner! Look at those perfectly tiny stitches… takes my breath away! When I look at a new post of yours, I like to scroll slowly for the surprise 🙂 Now I am inspired to get out my old pastels (chalk), but I am not sure how to affix the chalk to fabric so that it is permanent. (On paper, I would just spray, but I don’t know if that would work on fabric.) Any ideas? 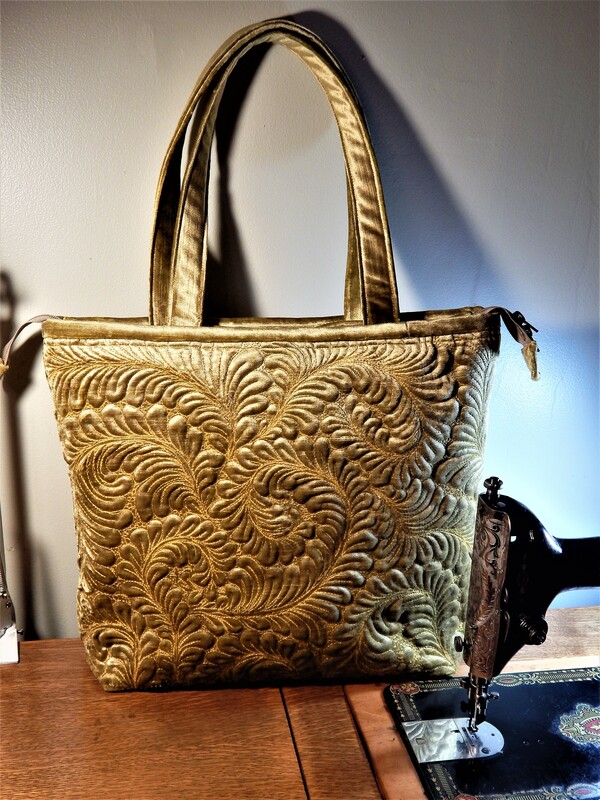 You get an amazing amount of stitching accomplished in a short amount of time! Your little quilt is beautiful. Sometimes what comes from the heart is more pleasing than the technicality of excellent piecework. Your new 70’s quilt top is very fun in a bold, unexpected way! Awesome small quilts! What talent! And I think that new one you just got is one I am missing…..?? 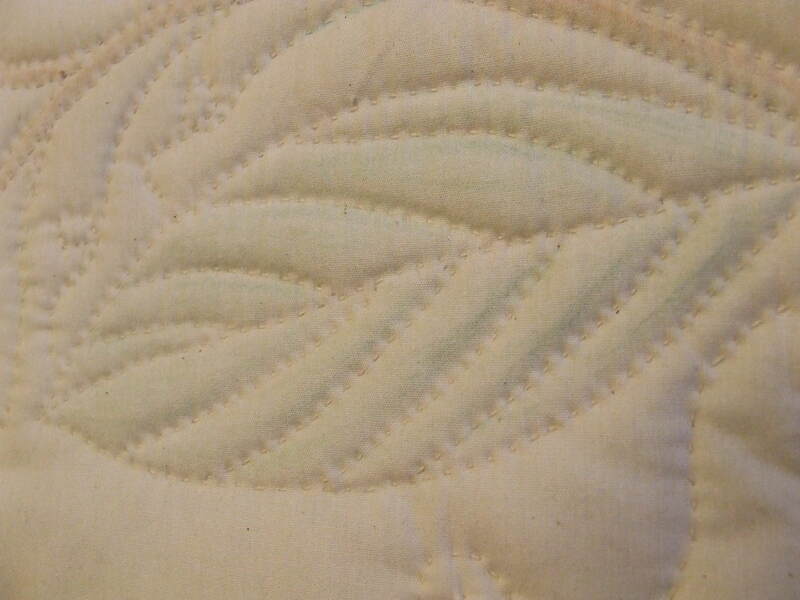 I marked my last quilt top with a Frixion marker and had amazing results. There is quite a bit of buzz about them on the internet!! 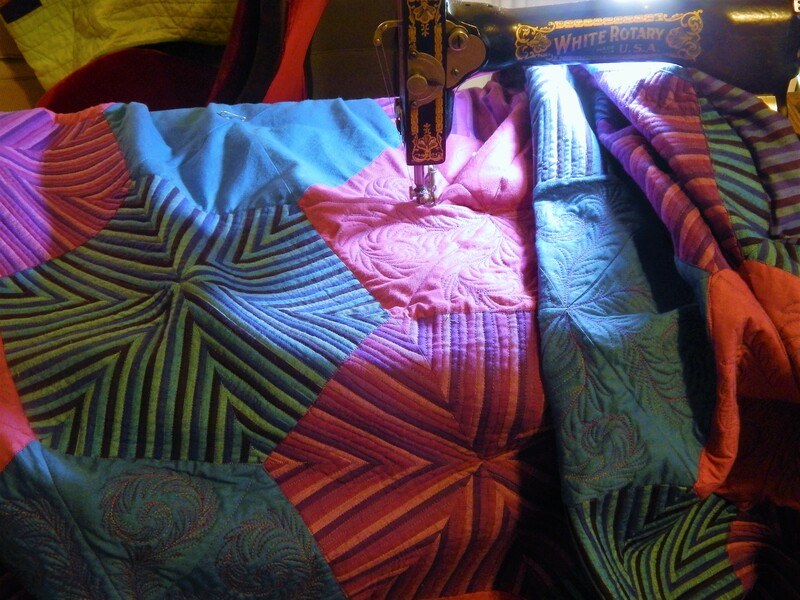 You are an inspiration to all who hand-quilt…and those that wish they did!! 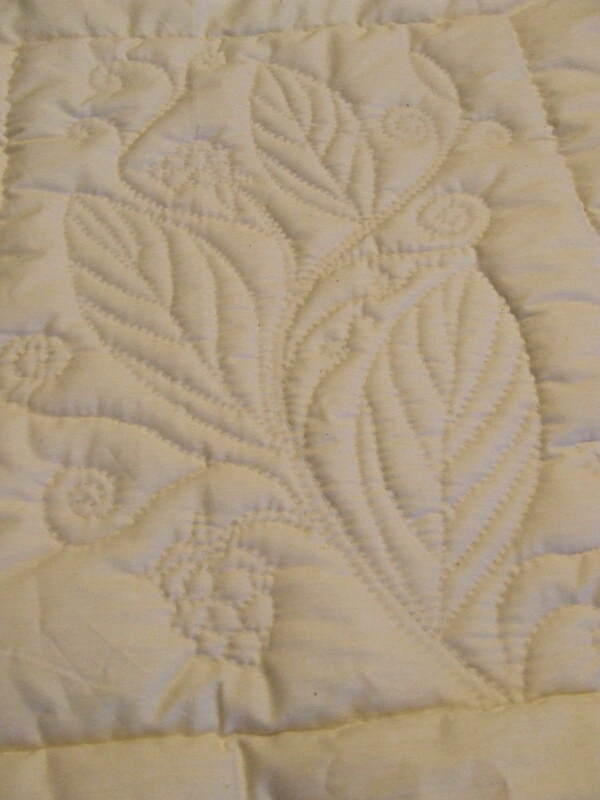 i also love to hand quilt. in fact, this is the only way i quilt. i just started a commission where my customer wants the baby quilt my mother made for her daughter included in the new quilt i am making. a challenge, but i think i have it figured out. jealous of the antique quilt tops. wow that does sound like a challenge….but I bet it will be a beauty! !